The current generation of smartphones has the on the go solution for digital photography with ever improving camera technologies and smart sharing options. There is a huge competition in the mobile camera space, and since a camera on your smartphone is among the major features you should be expecting right, in this article we have focused on some of the top smartphones in the market with best camera options. The product rankings in this article which you could see, are based on the ReviewGist Score - which combines ratings from expert reviewers from around the web to give you a single quality score from 1 to 100. Furthermore, we have narrowed down the selection of top smartphones with best camera which have been released very recently and have been acclaimed by most review sources. HTC One is the one impressive Android smartphone currently available in the market which scores well in the critical areas: design, screen, sound and camera. The phone has an outstanding 4.7 inch display with a pixel density of 468 ppi which is the highest among any other smartphone. The smartphone also offers you an unique feature for high quality image capturing with lesser Megapixels by introducing the proprietary Ultrapixel camera. HTC One comes with a camera resolution of 4 Megapixels - not merely Megapixels but Ultrapixels. Number of review sources embrace the HTC’s proprietary Ultrapixel camera with better sensor quality (a smaller sensor but much larger pixels) to capture significantly more light than any other camera with more Megapixels. Apart from the main camera, One is coupled with a front camera which offers pretty good quality images with a resolution of 2.1 Megapixels. CNET concludes that the phone has come up with feature-packed Ultrapixel camera which takes great low light pictures and lives up to its hype as marketed. Whereas TechRadar review confirms that most people will be overjoyed with the photo quality on the HTC One and, applauds the impressive combination of fast shooting, accurate focus, sharp continuous shooting and a nippy HDR mode, which makes the photos look good on the phone screen. HTC One can be recommended as the best smartphone with a great camera. Adding to the gorgeous dual frontal stereo speakers of this phone, if you want to experience the sleek interface of HTC’s Sense and if your choice of design leans towards aluminium body, HTC One should your choice. But if you would prefer to use a phone with a removable battery and expandable memory slot for extra space, Galaxy S4 can stand as your very next option. Nokia Lumia 928 has arrived very recently into the market exclusively from Verizon, with camera being one of the striking features of the device. Lumia 928, which runs on Windows Phone operating system has some of the above mid-range specifications, which you could afford without digging deeper into your pockets. With this model, Nokia claims to be letting more light inside the camera as it underlines the low light photo capturing experience with the PureView camera which optimises Carl Zeiss optics along with the much needed optical image stabilization feature. Nokia Lumia 928’s 8.7 Megapixels camera is another similar attempt from Nokia to do its best in offering good quality image capturing experience. The Nokia Lumia 928 reviews speak a lot good about the design/build quality and its high quality PureView camera. CNET review claims that the images taken from Lumia 928’s camera are sharp with high image quality overall while the PhoneArena review approves the PureView camera as “incredible” for macro or portrait shots outdoors. The other strong feature set of Lumia 928 apart from its camera includes 1.5 GHz dual core processor, 1080p video recording capability and AMOLED display which complements Windows Phone user interface. If you need most out of a smartphone camera, you can confidently opt for Lumia 928 and the device definitely has a well built and durable design too. For its price, Nokia Lumia 928 is the best in the market with all its specifications. But on the other hand, you may be disappointed by the availability of limited number of apps from the Windows Phone Store. So, those of you who are expecting a lot more from the application usage: try Android or iPhone offerings. Galaxy S4 is the latest and most advanced Android smartphone from Samsung. Compared to the Galaxy S3, the previous year’s flagship model, S4 is touted to be a more powerful 5-inch smartphone with 13 Megapixel camera and Full HD Super AMOLED display hosted by a robust 1.9 GHz quad-core processor and the latest version of Android operating system. Apart from these features, Samsung introduces you to a string of technical innovations with S4, like the creative touch free - gesture control features. Samsung Galaxy S4’s camera is stuffed with full of features and you could easily compare it with the connected camera offering from Samsung under the Galaxy line: in terms of pro features, manual controls and easy sharing options. Almost every reviewer has embraced the Galaxy S4’s camera which has got a zing through its advanced 13 Megapixels autofocus camera. CNET review rates the camera’s sensor as very good and the review also conveys overwhelmingly happy notes of photo capturing experience with excellent image quality. TechRadar review tells that the GS4’s camera is capable of taking some stunning photos and comes with a decent auto mode, which enables you to get really great shots no matter what the framing. Galaxy S4 offers the finest things: best display, optimum camera, latest Android OS and a blazing processor. Galaxy S4 should be your best choice if you are looking for an high-end smartphone with a great camera, which also has some very useful and customizable options like UI, expandable memory slot and, removable battery. Given its features like 4.2.2 Android Jelly Bean and faster processor, this smartphone with a plastic body can turn out to be too expensive; and you have many bargain smartphones out there if you are too specific about the price. Xperia Z is the Sony’s flagship smartphone released earlier this year with a premium spec sheet which any of the earlier Xperia phones didn’t have. The unique feature of this 5 inch Xperia smartphone which runs the latest Android OS and 1.5 GHz quad-core processor, is the water and dust resistant body. Added to that, the 13.1 Megapixel camera caters to those of you having photographic interests, and the memory expandability option helps you capturing a lot more photos. Xperia Z has a vast 13.1 Megapixel camera which has got mixed reviews over the web. CNET review has a few things to say about the camera’s performance in different lighting scenarios as the phone produces some wonderful images, providing lush shots regardless of lighting conditions. But the PhoneArena review is seemingly confronted with few deficiencies with the low light and outdoor performances while TechRadar review describes the results of camera tests as average at best. Furthermore, most reviews acclaim the features like water and dust resistance, brilliant hardware design, powerful performance and the usual high music quality which the Xperia phone delivers. Xperia Z is a recommendable phone which has the thinnest body and a beautiful design. And if you are a thorough smartphone camera user, Xperia Z’s camera may not be acknowledged as the best in terms of image quality, even though it has a 13.1 resolution camera. With least drawbacks, Sony delivers you the performance with Xperia Z this time with high-end specs of display, processor and OS, which you would expect from a typical high-end smartphone. This selection of smartphones with the best cameras was compiled in July 2013 and is based on reviews collected from expert sources from around the web. 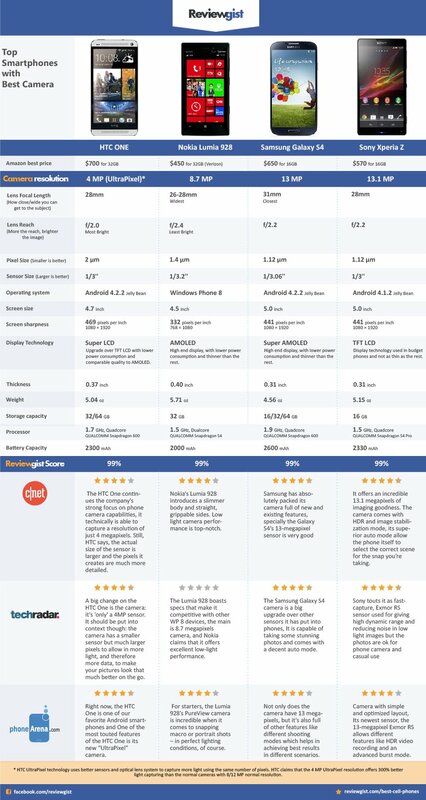 At ReviewGist we maintain a continuously updated list of the top smartphones by rounding up expert smartphone reviews from around the web. For the latest list of the top smartphones with the best cameras please check at the ReviewGist site here.